Harness drivers will have their “pedal to the metal” this weekend, no doubt, as they gun for big purses and prestige over profit. TwinSpires carries the DuQuoin State Fair from Illinois and even with reduced status and purses, there is plenty there to bet about, so to speak, and we cover what may be the best races to bet in this edition. On the regular circuit, Mohawk delivers elims for major freshmen affairs in the Metro Pace and She’s A Great Lady, the latter for only filly pacers. Also on the program, elims for the Canadian Pacing Derby (see Breeders Crown blog, info below). Due to deadline restraints, we have updates for the Zweig Memorial at Vernon and soph pacers in the Cane Pace elim at Tioga. SEE UPDATES BELOW. The Hambletonian Society and TwinSpires have activated the Breeders Crown Countdown, following prospective entries from all eight divisions in the classic events, scheduled to be presented again this year on a single card at Woodbine. Check the blog often for updates on great betting opportunities that don’t appear in the regular TwinSpires blog. The biggest two-year-old colt and gelding affair develops its field with elims on the Mohawk Aug. 25 program. Let’s look at the elims. The first split has two from hot trainer Tony Alagna and a pair from Casie Coleman. But Virgil Morgan, Jr.’s Bigrisk is here and he is very serious about being a contender in the division this year. His odds will be juicy, especially if driver Brian Sears opts to take the other colt he is listed to guide for Coleman. The middle split offers what could be a flashy mile, considering the presence of Captaintreacherous, who will be launching his usual assault, though this time he must deal with Johny Rock. Those two could burn one another out but it is hard just now to try to beat the “Captain,” who is at the top of his game. Johny Rock could be second if he doesn’t challenge the Captain along the way, making for very cheap exotics. The nightcap elim is the most contested of the three, making for a chance to see what Teresas Beach can deliver. This Somebeachsomewhere guy is being trained for the big money, so expect a big mile and maybe a big price. The frosh-filly pacers meet in the She’s A Great Lady elims on this card. In the first split we see three of the gals we have been following through the Grand Circuit stakes. We expect all of them to make the final. This could mean a triple in some order, including Miss Lauren, Jerseylicious and Cult Status. The latter will, no doubt be the highest odds and the better key horse. In split two we will go with Parlee Beach again. Last week she was the favorite but couldn’t get up. Tonight we think she may be co-favored, punching her odds up a bit, and race a big mile. It’s the former home of the Hambletonian and World Trotting Derby and although those major events are gone, the sheer speed of this track will astound you. On the hottest days it becomes faster but it even smokes, so to speak, when wet. Here is a rundown of the races, with a focus on some horses to watch in various events. Friday, Aug. 24, with a 7 p.m. Central post time. In Race 1 for frosh trotters, you might take a chance on Emotional Force. Just how fast he can go when not running will be tested here. Coming from the fair in Springfield and seeing his early foot previous to that, he is worthy of improving on this oval. In Race 2, Crysta Belle comes out of a strong attempt to wire a similar bunch of frosh-filly trotters on the fair circuit and may find her way around and be slightly ignored for a mistaken class hike. In Race 5, Lane’s Game has speed to spare and no doubt will be firing early to get in front of her inside foe, Fox Valley Sienna. But that one may be over-bet, leaving a price for this speedy mare. In Race 7, Tinkers Damn will rightfully be the choice but maybe not by much in this short field that appears to hold challenges for her. So a price (you judge the value) may be at hand. She was second to Boi at Springfield and that one would clobber this field. In Race 9, outsider BC’s Bully could upset and pay a good price. No one will like him from post 9 but considering his style of racing he may be able to defy some cheap speed here and make the kind of swooping late move that almost got him a Springfield win while well supported. Saturday and Sunday, DuQuoin offers ICF (Illinois-conceived-and-foaled stakes) that were not drawn at press time. In the event that some good betting possibilities arise, check my Twitter account for them [ @FrankCotolo ]. The Hambo crews and more go at it in the reloaded-with-cash Zweig Memorial finals for colts, fillies, including consolations. Those fields will draw after press time so check updates here, at Twitter and at the Breeders Crown Countdown blog. The same holds true for any elims created for the Cane Pace at Tioga, Sunday, Aug. 26. 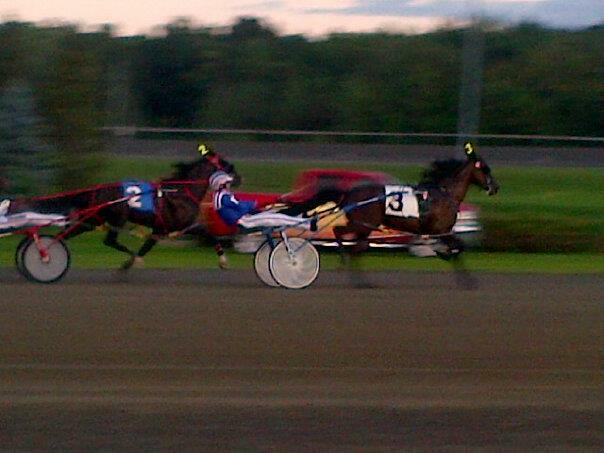 Sunday, Aug. 26, Tioga Downs hosts a $107,572 elim for the Cane Pace, the final to go on Monday, Sept. 3. Two big stars, A Rocknroll Dance and Time To Roll, will appear in the final without having to face an elim. The top seven from the elim join them in the $322,716 mile. Three others from the division, Pet Rock, State Treasurer and Heston Blue Chip, supplemented to the stakes and have to race in the elim with Mybrothergeorge, Dynamic Youth, I Fought Dalaw, Bettor’s Edge, Steelhead Hanover and Simply Business. Pet Rock has been a favorite of ours from before he proved to be a contender in the division. Supplementing to this is a serious investment and he will be all out in this elim. Although State Treasurer and “Heston” are also paying to get it, they may not be at their peaks right now. They could make the final but Pet Rock may be edgy enough now to win the elim and take on the likes of the two byes next week. The $350,000 Zweig final for the soph trotting colts at Vernon on Aug. 26 brings together less of the top glamour-boy trotters than we expected. Certainly the Hambo winner, Market Share, is out to redeem himself from the loss to Googoo Gaagaa in the Colonial and Uncle Peter is searching to find his best form after a terrible appearance in that event and losing as the Hambo favorite. Archangel returns to his home state for redemption, also, and Coraggioso meets this group with new connections after passing the Hambo for medical reasons. I haven’t given up on Uncle Peter, who gets his trainer back in the bike, which is a good sign. He will be a great price and still has to prove he has lost the talent he was showing and not just momentum. Market Share will again look for a hot pace to trot after, while Archangel and Coraggioso will be gunning. If Uncle Peter is all right, he will take advantage of the other speed and not try any big moves until he can make one big move. If he returns to his best form and does so at the probable price he will offer, stamp it a bet because you may never get this kind of price on him again. There is little to say about the $150,000 filly version because Check Me Out is here again and you know what I know—if she doesn’t break, she wins. Look for 3-2 or up if the crowd becomes hesitant about her winning.